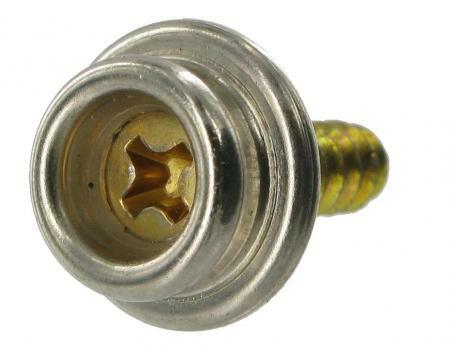 Duradot Self Tapping Press Stud in nickel with brass finish screw. Duradot Self Tapping Press Stud. This chrome stud is the type commonly found on vintage cars or even modern pick-ups to secure the hood or trunk cover.The thread is a self tapper and is 3/8" long. P.S. I just remembered, I have also seen it on prams as well. Anyway I hope this is the thing you are looking for and that it helps you out. P.P.S. Sara just said she has seen it on an MGBGT and a Midget. P.P.S. Sara just got back from a holiday on a Norfolk Broads cruiser and she noticed these studs fastened on the canopy, so they're good for boats as well as cars, it seems.